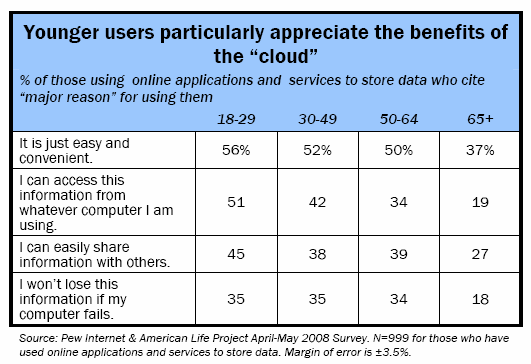 Older adults’ are seemingly the ones who could benefit most from cloud computing. Keeping mail or other information in the cloud means that the user doesn’t have to configure their mail client, maintain their computer, etc. I recently completed an evaluation of a cloud computing tool developed at NC State University, VCL, that delivers applications to the desktop for the NC Community College System. Of note were disconnects between instructors (generally older) and the students (generally younger) on some responses related to reliability and accessibility of the technology. Happy to send the report to anyone whose interested. That sounds interesting and confirms the Pew report. I wonder how each stakeholder’s future usage will be affected by their perceptions of reliability and accessibility. I wonder if for older adults it’s a perception of safety. Perhaps because the data doesn’t have the appearance of being stored on their computer, as it does with a mail client, it doesn’t seem as safe.